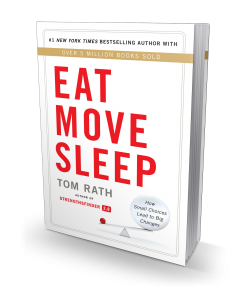 Eat Move Sleep is the latest New York Times bestseller from Tom Rath, featuring a new assessment, personalized Eat Move Sleep Plan, and a host of online tools for individuals, groups, and organizations. While Tom’s bestsellers on strengths and well-being have inspired more than 6 million people in the last decade, Eat Move Sleep reveals his greatest passion and expertise. Quietly managing a serious illness for more than 20 years, Tom has assembled a wide range of information on the impact of eating, moving and sleeping. Written in his classic conversational style, Eat Move Sleep features the most proven and practical ideas from his research. Tom Rath is an author and researcher who studies the role of human behavior in business, health and well-being. Tom’s latest bestseller, Are You Fully Charged? : The Three Keys to Energizing Your Work and Life is receiving acclaim as “Rath’s best book yet” and is the subject of a feature-length documentary in late stages of production. This book and Tom’s second children’s book, The Rechargeables: Eat Move Sleep, were released in mid-2015. Tom has written six New York Times and Wall Street Journal bestsellers over the past decade, starting with the #1 New York Times bestseller How Full Is Your Bucket? His book StrengthsFinder 2.0 was the top-selling book of 2013 and 2014 worldwide on Amazon.com. Tom’s latest bestsellers are Strengths Based Leadership, Wellbeing, and Eat Move Sleep: How Small Choices Lead to Big Changes. In total, his books have sold more than 6 million copies and have made more than 300 appearances on the Wall Street Journal bestseller list. In addition to his work as a researcher, writer and speaker, Tom serves as a senior scientist for and advisor to Gallup, where he previously spent thirteen years leading the organization’s work on employee engagement, strengths, leadership and well-being. He is also a scientific advisor to Welbe, a startup focused on wearable technology. Tom previously served as vice chairman of the VHL cancer research organization. He holds degrees from the University of Michigan and the University of Pennsylvania, where he is now a regular guest lecturer. 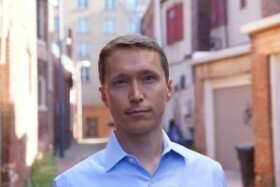 Tom, his wife, Ashley, and their two children live in Arlington, Virginia.